The last day in Beechworth. In the morning, I tried to paint Post Office again because I wasn't happy last time. 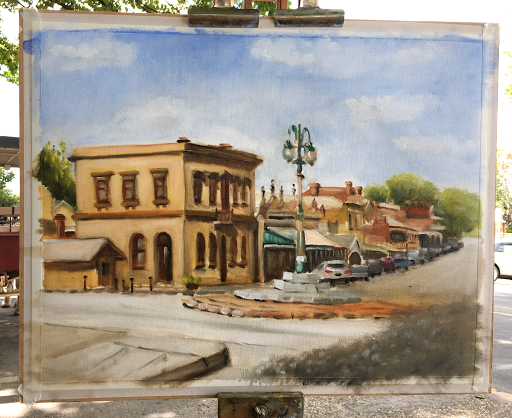 However the light wasn't ideal, entire building was in shadow, so, I set up easel here, looking towards a main street. Bank of Victoria building at the corner. Although it's Sunday, it wasn't that busy. There's jazz music going on from across the street. Everybody was so relaxed. I enjoyed it a lot. I didn't know how to paint a shadow from trees behind me. I'll have to ask Greg. On my way back to Melbourne, I stopped over at Benalla Art Gallery. None of the exhibitions was interesting. I'm not a big fan of Brett Whiteley. 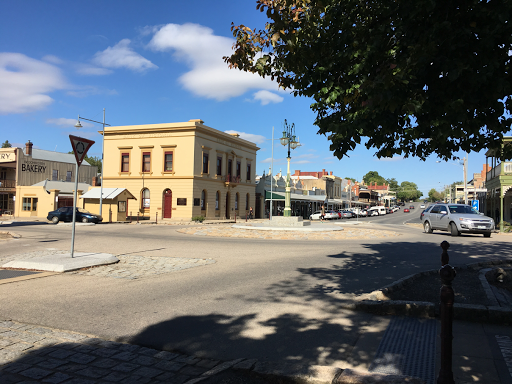 I had a great stay at Historic Beechworth. A great Airbnb. Gail was such a lovely lady. I have to say, Yackandandah was a highlight. I really enjoyed the area. I felt so at home, which is very rare. I'll definitely go back.